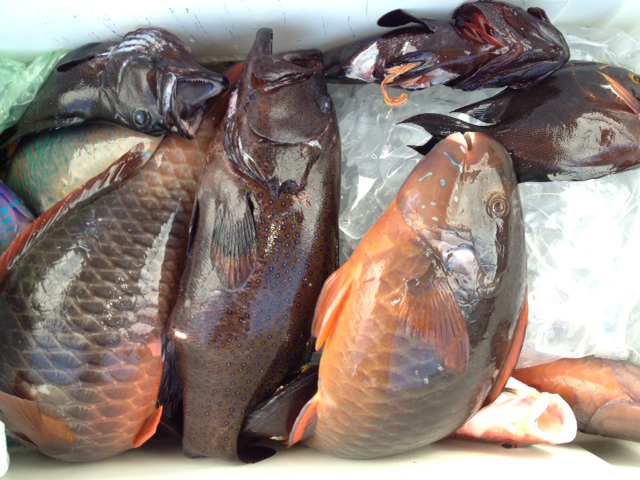 Past few days have been beautiful on the windward side so we decided to load up and go fishing. 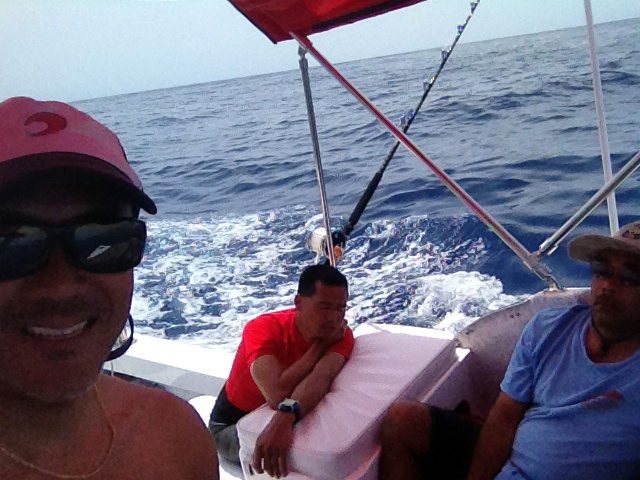 Unfortunately the pelagics were slow and nothing bit so the boys decided to go zzzz. Thatʻs how it goes sometimes. 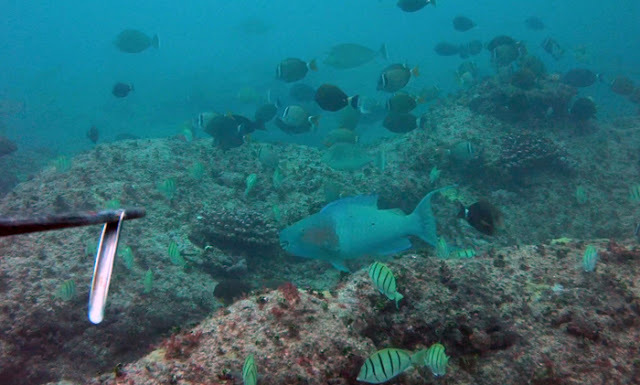 If pelagics not biting the hook the plan "b" was to go find the reef fish. 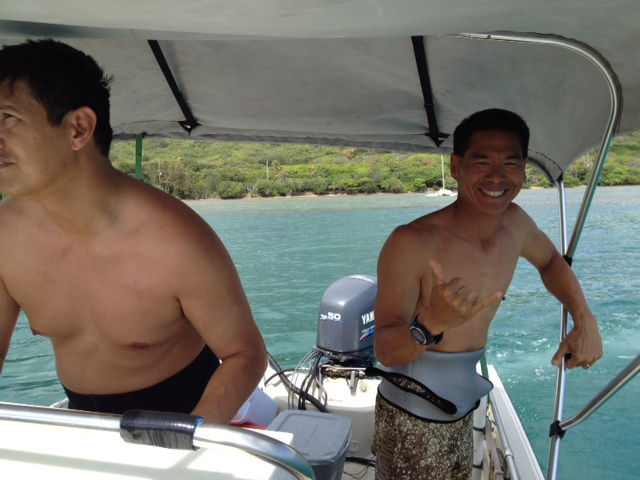 Kirby Fukunaga , Kylen Yamakawa, Izaiah Moniz and me boarded the Go-Naminori boat and headed out for a quick dive. This is the beautiful "Chinamans Hat". 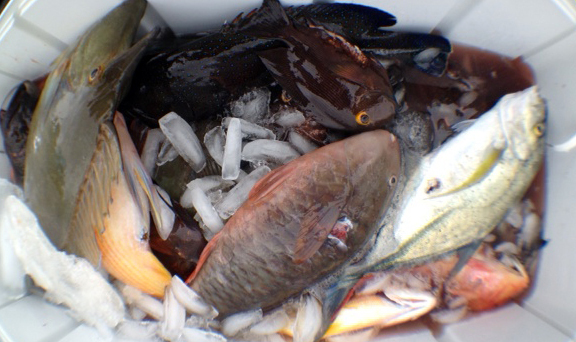 In a few hours and 74 dives later for me our cooler catch looked like this and boys were very happy and tired. Here Kylen (left) and Izaiah (right) with their prize. Good job boys! Keep on diving! 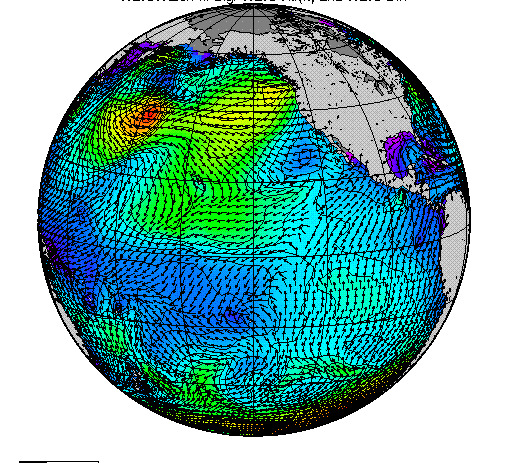 Weather looking perfect for this weekend as winds lighten and surf comes up. Everyone will be happy and ready for work on Monday. Here is another gun cam test shot with this solo menpachi "U'u". These little guys seem so curious at times and will peak their head out of their hole and dash back in. Today I let this fish live another day. Tomorrow may be another story...to be continued. This week I've been testing out the intova camera HD Hero and been enjoying it. 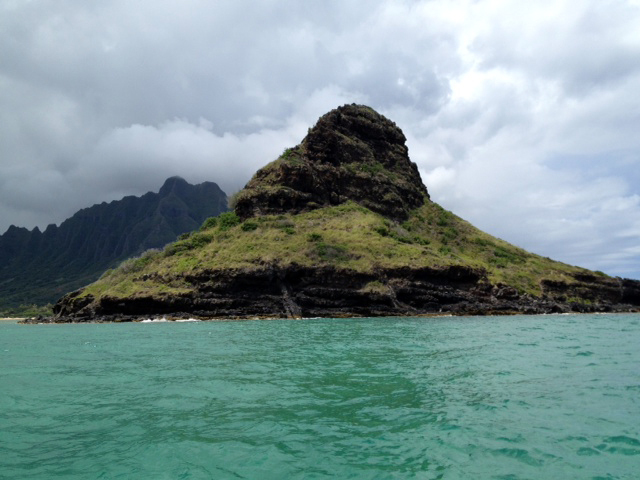 Swam out with my dive partner Kekoa what seemed like about a mile out and found some nice grounds. Always enjoy looking for new grounds and trying new things and I haven't shore dove for a while so we gave it a go! 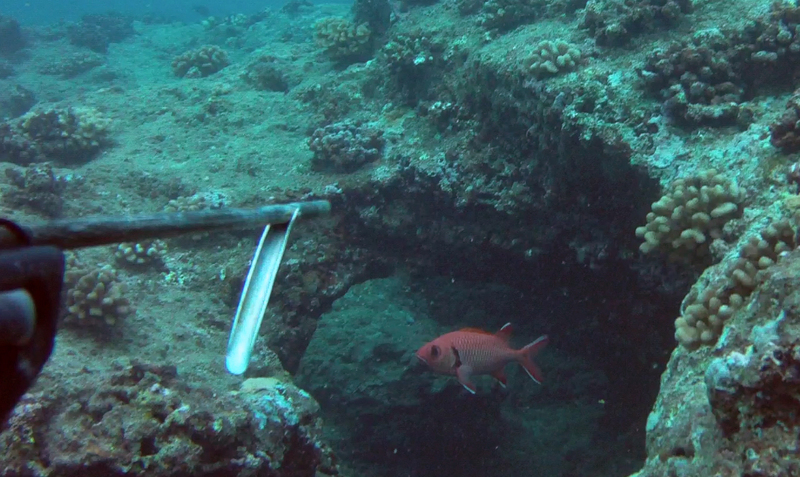 I mounted it to my 120 cm gun and got a few grabs with some video and stills. 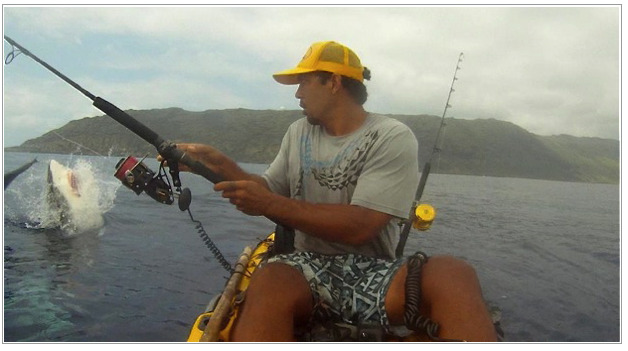 Here this 14-15 lb uhu swam up to me but decided not to pull the trigger on this male breeder. We was actually looking for the black color rois but for some reason all we saw was red? These go for $14.99/lb at Safeway. Luckily this open market was FREE! 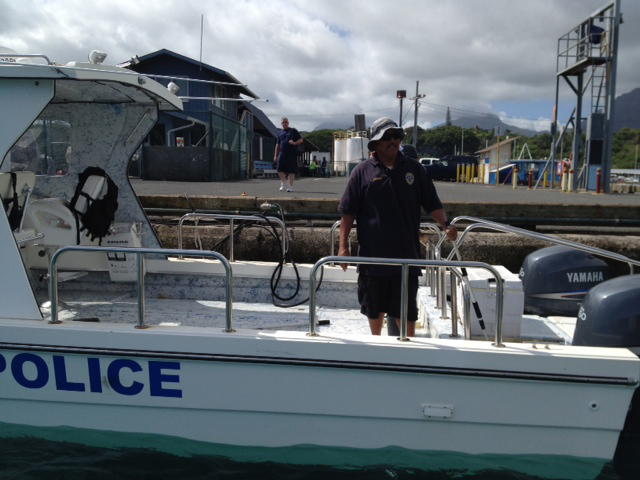 Weather was rainy but we made it safely and executed our dive plan perfectly. 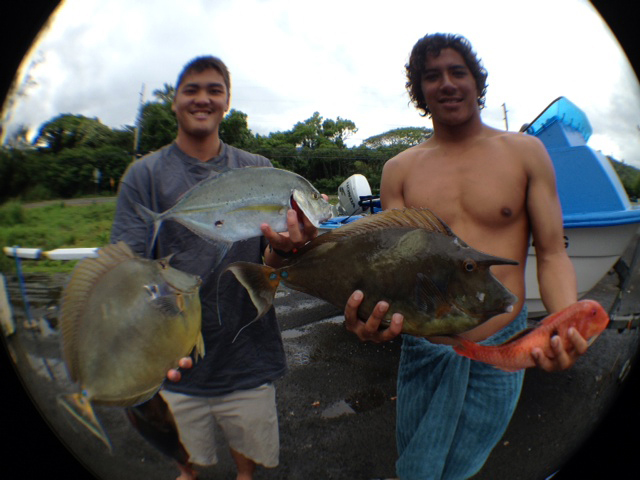 Cleaned up our fish and headed home with todays dinner! Today we had a jobsite visit to film some "Roi Hunters". Mike Hatcher and Bruce Wong called me and I brought my camera and went to work. We were stopped by the police at the harbor, but luckily it was our good friend Al Lagunte doing his job enforcing the law. He wished us luck and thats all we needed to hear. The pier was packed and lots of people at the sandbar, I think I counted 24 boats there. 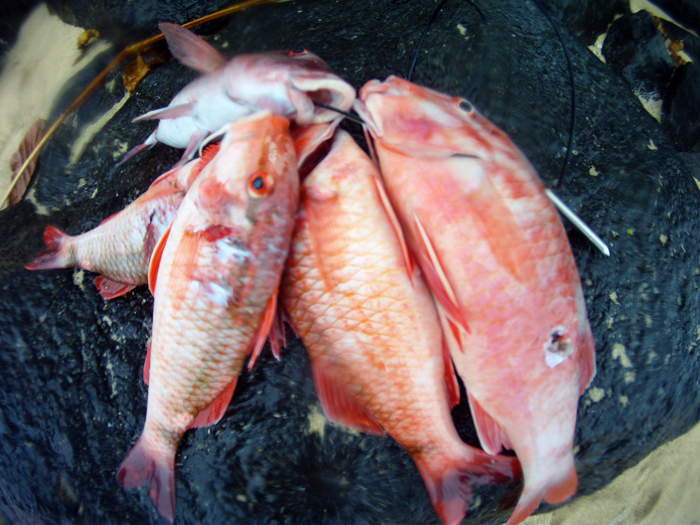 At the end of the day, we got a nice mix of rois and uhus and boys were happy to get their dinner for the week. Thanks guys for a fun day on the water. Then I came home and did more filming in the Red Sea Studio with Merlinda Garma. What a long day at work, was dead tired but I love my job. Tomorrow we get to do it all over again! 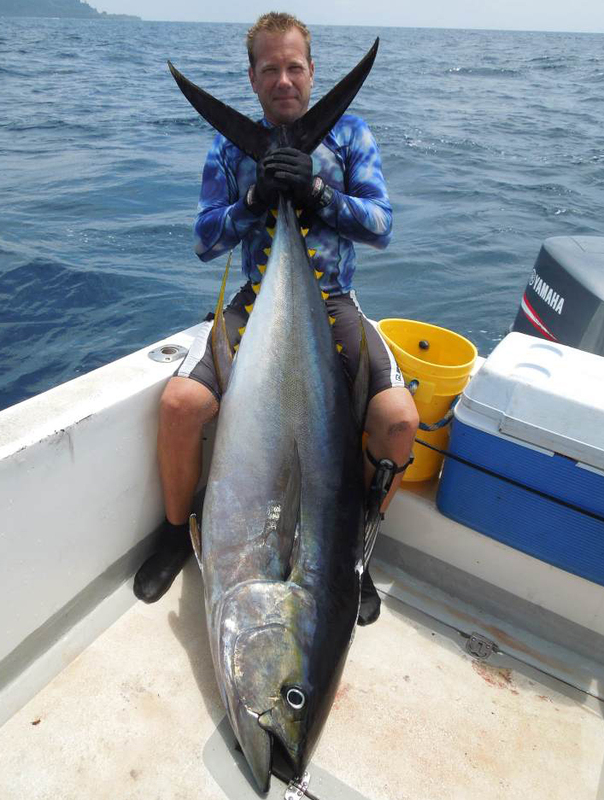 A friend of mine Wayne Jarrett sent me photos of his recent catch in Panama. 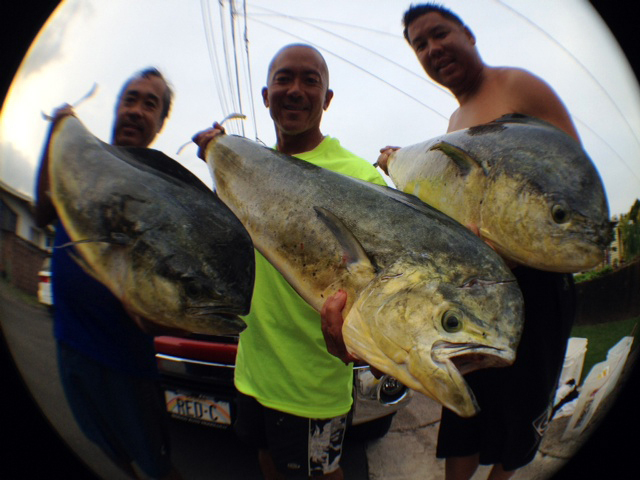 A toad of a yellowfin weighing in around 150 lbs. It was his first tuna and a beauty! Once you get the Ahi Fever its hard to let go. 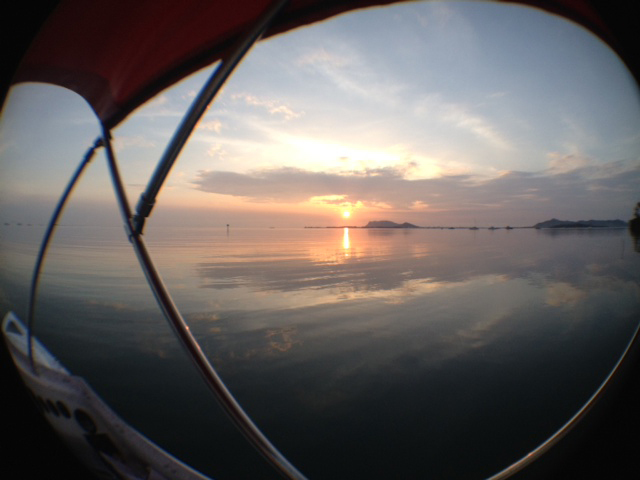 Wayne joined us on our last trip to La Paz and is coming again in July so we are stoked to see him. He was nicknamed "Wahoo Wayne" but now his new name is "Tuna Cowboy". Congrats Wayne and thanks for sharing your story! 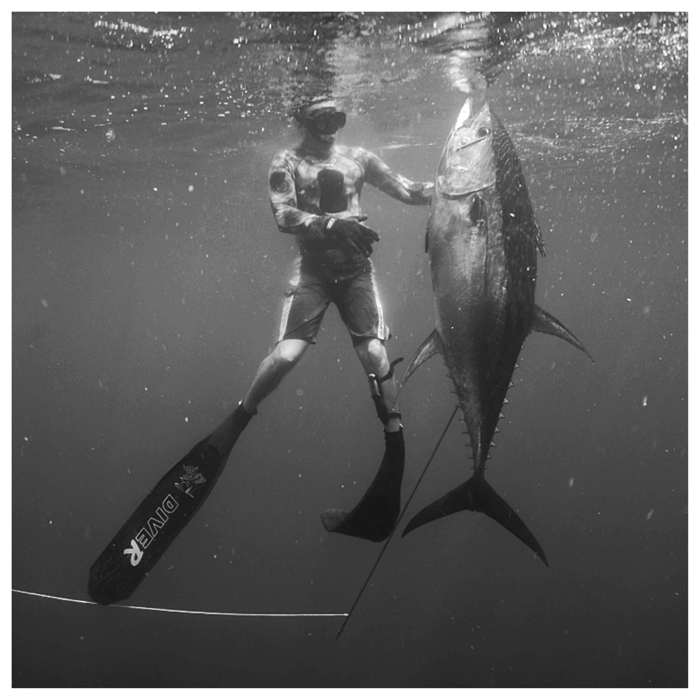 Ahi Season is coming soon here to Hawaii so get ready! 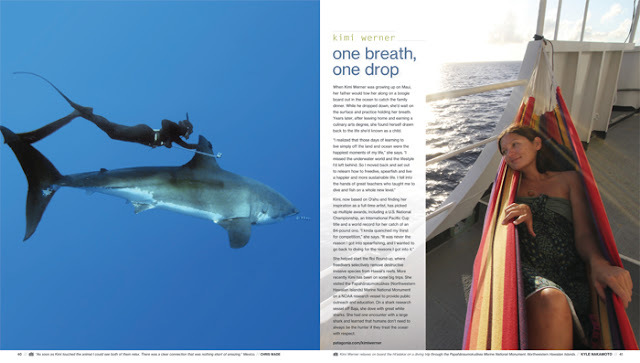 One of Hawaii's top female freedive spearfisher, Kimi Werner making the news again! Kimi has been a great role model and inspiration for many divers and non-divers alike. Having a live-simply lifestyle amidst her many opportunities to travel, film, model, cook, and paint she enjoys what she does and thats the main thing. 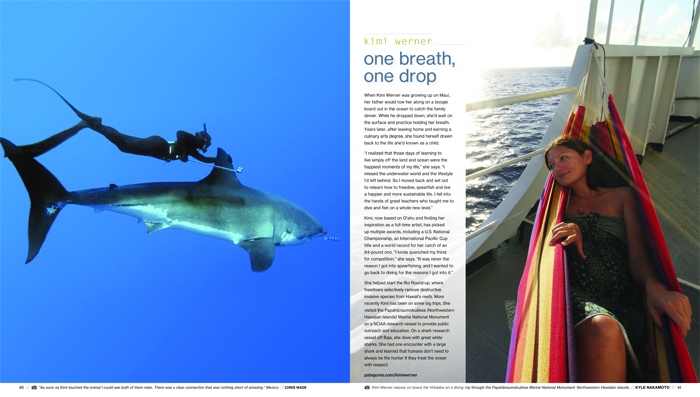 Patagonia currently has a big spread on their surf catalog 2013 with her amazing ride on a great white shark and experiences to the Northwest Hawaiian Islands (which I had the privilege to join the NOAA team to film and photo). Congrats Kimi! I've been watching the weather all week to see what the waves and wind would be doing. It was kind of tricky with these southeast winds but we did manage to make it out to the ocean store for some fresh fish. 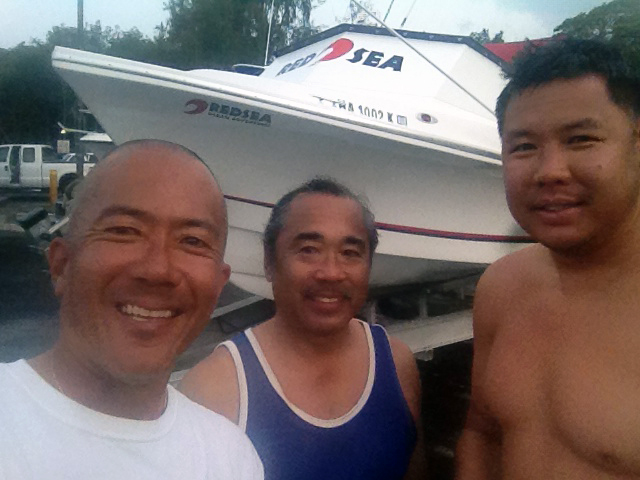 James Oshiro and Kekoa Mau was off work so we loaded up the Red Sea Boat with our diving and fishing gear and headed out! We notice a big boat in the distance heading out way, the "Nisei" its a popular commercial fishing boat that catches lots of fish and we let them pass. We watch as they motor ahead and wonder where they were going to fish today? We continue our route and head to our waypoint. Water was little bumpy at first so we decided to set out the lines and within 45 minutes we got our first strike in the blind. 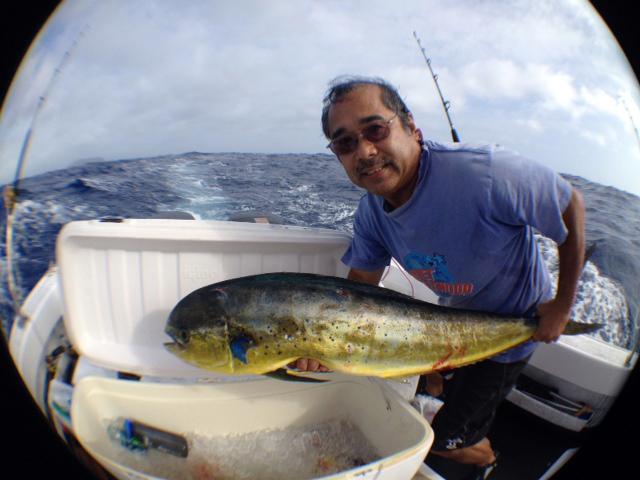 A nice cow mahi hit my gaji lure and after several attempts gaffing it, we got it in the boat. 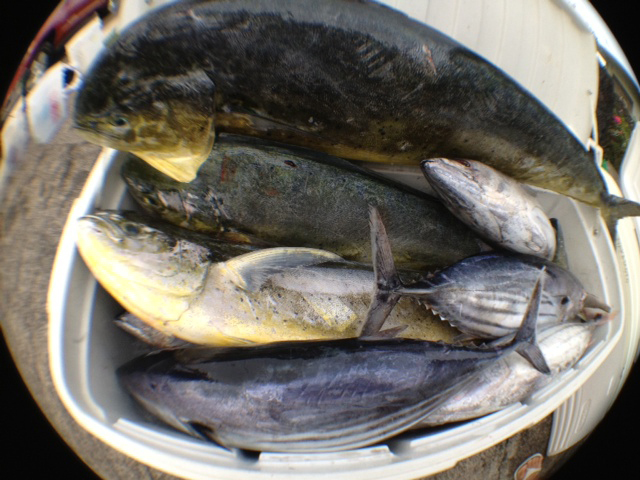 We headed further out and got another mahi, then another...At this point I'm thinking should we turn or burn? Turn around and head in since we got plenty or burn more fuel and look for tuna? I tell Kekoa, "Wow can't believe we haven't got any aku yet"! Then a sign from above comes into sight. "Birds"! Yes a whole **%## of them! We follow along side and the corners go off! Double! I turn on my go pro, then another double, then another. As I watched the boys pull in the haul one after another I thought I felt like a captain of a tuna fishing boat as the akus were flying in the boat one after another. At this point our cooler was full and we had our fun for the day and fish for all our family and friends. 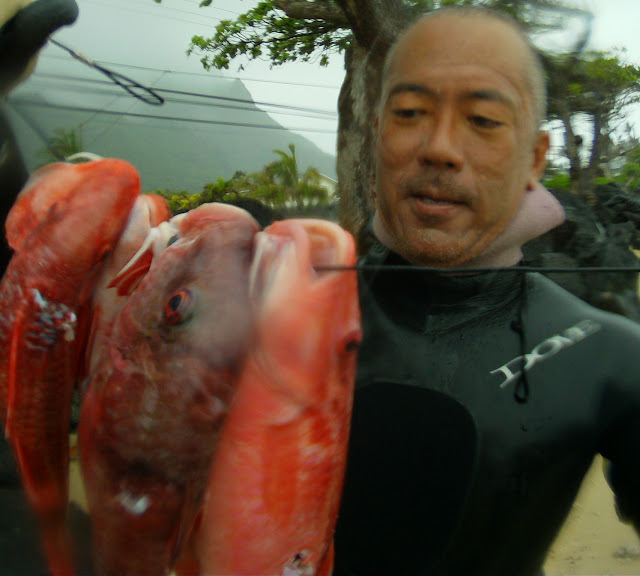 We came in early, washed up the boat, took a few pics with the "Sansei fisherman" , had a awesome dinner at Crows Buffet with fresh fish and called it day. Wow what a week of surf! Northshore has been going off all week with some of the best waves all winter. South shores had a little bump and much more swells to come. Hope you got some good surf! 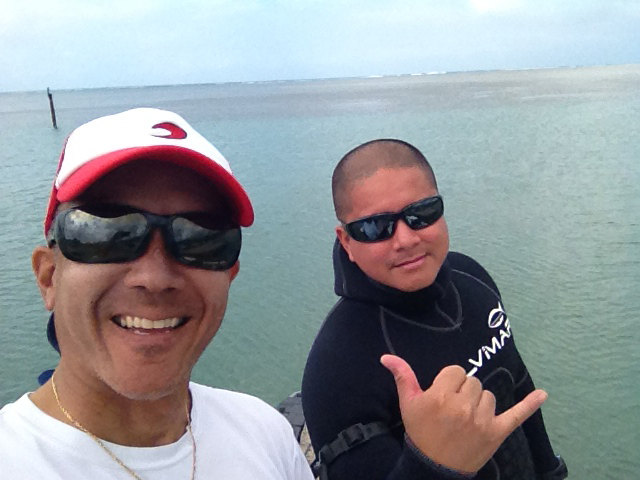 We are working on the Hawaiian Open show for Hawaii Skin Diver and diving with Shane "Bam Bam" Cabilas. Shane is a good diver and fun to hang around. Hope to be able to get some good footage for our viewers with these light winds coming this week. Had a great dinner with the uhu we got the other week. 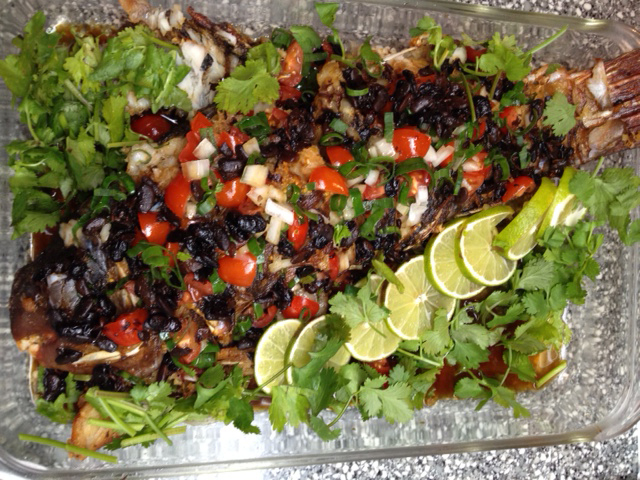 My mom made this black bean style steamed uhu that broke da mouth! (translation: delicious, very tasty, oishi). Our ice box is all empty with only ice to burn so time to get ready to go to the super market again. North shore still not done yet! Surf coming up this afternoon and peaking tomorrow in the 8-10 ft range. Winds are trades so should be good! 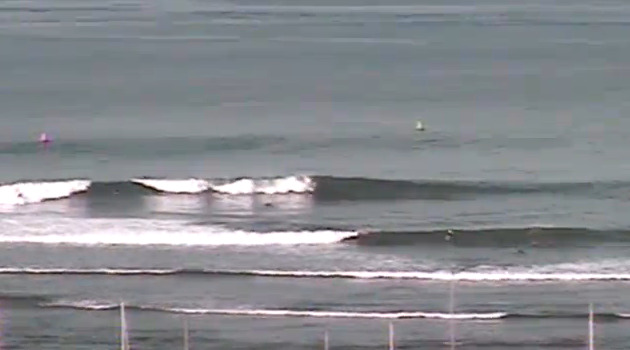 South shores also got some chest/shoulder high sets and this starts the summer swells that usually begins around this time. Got a good session out with the boys (Nick, Cedric, a few others out yesterday). Surf safe and see you in the water! Power Breakfast...Steel cut oatmeal + French Toast + Frest Fruits. Congratulations to Carissa Moore for winning the womens Rip Curl Cup at Bells beach, Australia. 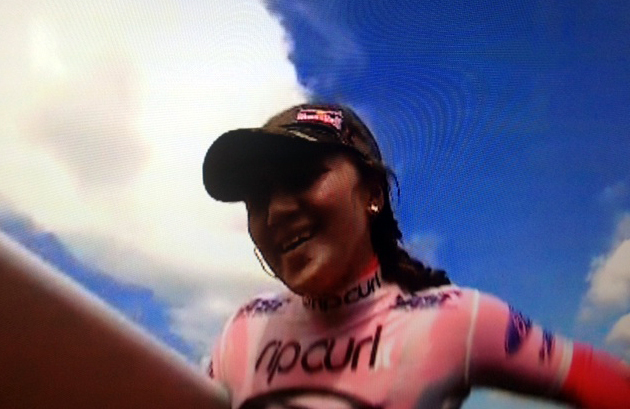 She represented Hawaii well and may win the 2013 women's title if she keeps it up. 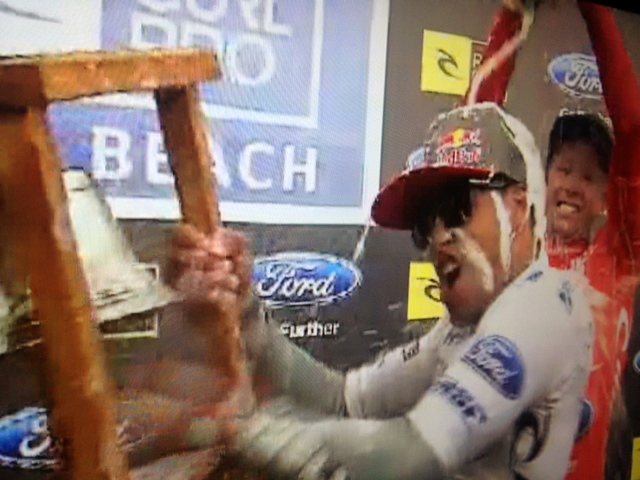 Also to Adriano De Souza from Brazil for winning the men's Rip Curl Cup. He went up against Nat Young (USA) and won it at the end. "You gotta win it to ring it!" Next stop for the ASP tour is brazil. Back here at home, north west winds will slowly be replaced with trades soon with swells on both south and north shores so time to wax it up!